Oooh, he looks like he's doing great. Filling out that sweater nicely! Way to go Tia! Are you going to knit blocks for Callum, too? Ouch. 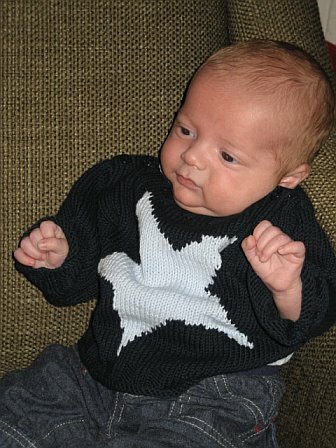 Thanks so much, by the way, for knitting the Child's Placket Neck Sweater, and making us all aware of the errata. I knit it for my first niece, and it went without a hitch. Just posted it this week. I love the term! I think I'll adopt it. I'm still waiting for a boomerang, but I recently posted a few to my blog. so cute! That photo almost looks like he was about to do a little dance before the camera snapped him.